The report “Filling Equipment Market by Industry (Food, Beverage, Pharmaceutical, Cosmetics), Type (Rotary, Volumetric, Aseptic, Net Weight), Process (Manual, Semi-Automatic, Automatic), Product (Solid, Semi-Solid, Liquid) & Geography - Global Trend & Forecast to 2019”, defines the filling equipment market and segments it into food, beverage, pharmaceutical, and cosmetic segments with analyses and projections of the market size of each of these segments, in terms of value. It also identifies the driving and restraining factors for the filling equipment market with an analysis of trends, opportunities, burning issues, and winning imperatives. The filling equipment market is driven by new technology development, which has further increased the demand for food packaging and changing consumer lifestyle. The key market players adopt new product launches as their preferred strategy to sustain the competition in the market. Automation in filling equipment has further driven the market. 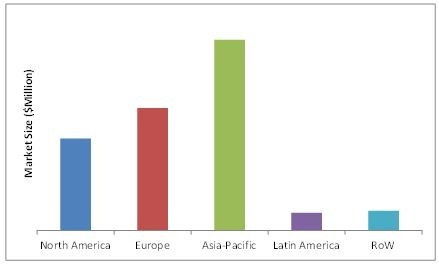 In 2013, Asia-Pacific region was the largest market for filling equipment. The Asia-Pacific market for filling equipment is projected to grow at the highest CAGR due to the emerging filling equipment markets such as China and India. The market is estimated to grow with the increase in technology development of filling equipment. The report includes development strategies and product portfolio of the leading companies. The company profiles of leading companies such as Krones AG (Germany), Robert Bosch GmbH (Germany), Coesia S.p.A. (Italy), have been included in the report. Players in the filling equipment market constantly invest in R&D to introduce new filling technology to gain a competitive edge over others in the market.